Manufacturing | E-BEAM Services, Inc.
E-BEAM Services was on a growth trajectory, but the company’s aging software couldn’t keep up. The team needed a modern work order management system to boost productivity, reduce overhead, add visibility to production, and power growth. A leader in the contract electron beam processing industry, E-BEAM uses high power electron accelerators to irradiate client goods. Their electron beam technology is used for medical device sterilization and is also used to improve the performance of a broad range of industrial materials by enabling crosslinking and rheology control of polymers. Gaslight kicked off the project with a deep dive discovery process, learning how orders moved from goods arriving at the warehouse to being grouped under the beam to sending invoices to clients. Next the team moved into continuous delivery. Gaslight worked closely with E-BEAM to identify the most valuable features to build each week then E-BEAM tested the work. Our lean and agile approach to building custom software helped reduce this project’s risk and ensure we delivered software that drove real business results. The final system, named PRESTO, delivers value across the board. The software serves up visual business insights with a few clicks. 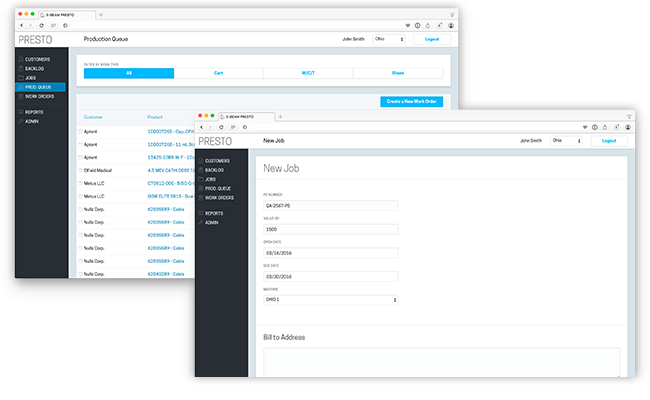 The job history screen allows you to see how any past job moved through the company’s process while the job progress screen tracks key performance indicators. Rather than hold the company’s complex work process in a few key employees’ heads, the new system captures and tracks it in a place everyone can see. People on the production floor now touch the system as they run jobs. And the work process across locations is more unified than ever before. 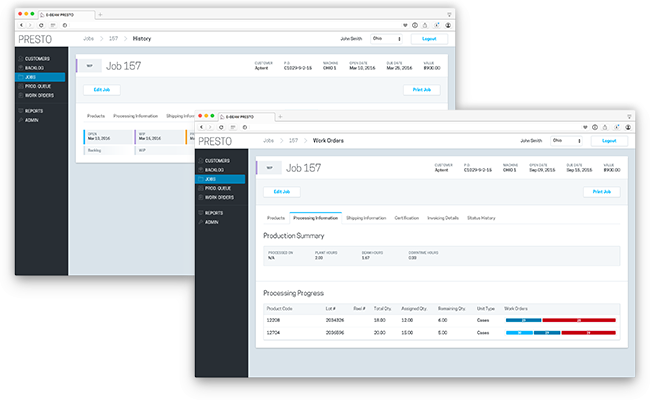 The app’s production queue screen helps reduce the complexity needed to plan and combine work across different client orders. Now it’s easier to see all the customer product and batch those items into work orders that increase beam efficiency. 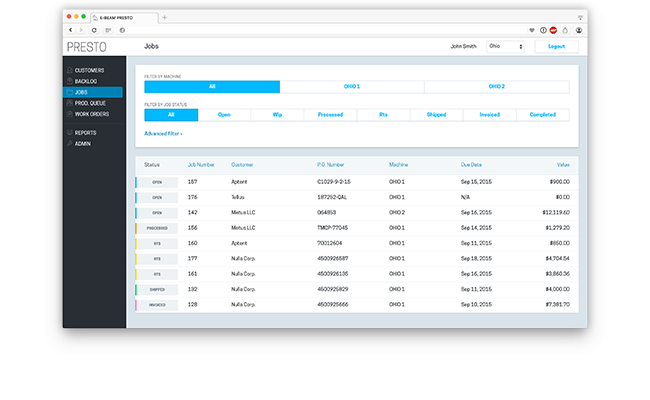 The new job screen cuts down admin work by closely matching the company’s work process and eliminating a duplicate paper process necessary with the old system. All these benefits help the company track against its growth plan. 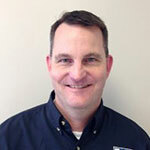 A few months after implementing the system, E-BEAM’s customer service manager was able to go on a series of sales calls for the first time ever. Previously, she was too integral to scheduling and planning work to leave the office. Rolling out the PRESTO system was almost as easy as flipping a light switch. The new system replaced all the old software’s functionality and data, so there was no need to run both systems in parallel. Staff described the new app’s user experience as simple and intuitive, and rollout to facilities in three different states required little-to-no training. Need to replace an aging software system?